Made of brass nickel plated, 100mm x 50mm length x dia in size mounted on insulated metal stand with base. Tubes, Centrifuge, Conical Bottom Graduated. We have highly acknowledged organization engaged in presenting a remarkable range of Metal Sheet Conical Tube. Fostered with enormous business understanding of this realm, we are involved in presenting a broad consignment of PP Tube. According to the requirements of our valuable customers, we bring forth to them an extensive array of Conical Test Tube. 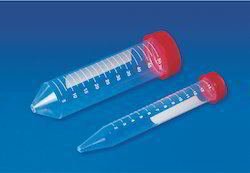 This Conical Test Tube has been clinically tested and is known for its quality finish. 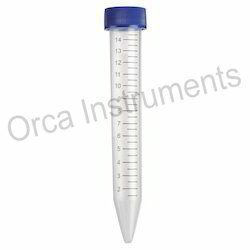 These Conical Test Tubes are highly durable and are available at market leading prices to our beloved patrons. Sobha Medical Equipment (P) Ltd.
Increase traceability of samples with one of the largest writing areas on the market when using Thermo Scientific™ Nunc™ 15mL & 50mL Conical Sterile Polypropylene Centrifuge Tubes. These premium, high-quality conical tubes are environmentally friendly and offer high cleanliness with a recyclable plastic rack.